Wakaya Club and Spa is a serene retreat in Fiji that offers gracious living, sophisticated cuisine and unparalleled leisure opportunities in one of the most remote and pristine corners of the world. The resort is situated on Wakaya Island, a private 2,200 acre hideaway surrounded by a protected coral reef, serene lagoons, majestic cliffs and pristine white sand beaches. Wakaya’s private aircraft delivers you to the island where you are greeted by the warm and friendly Fijian staff before being completely immersed in the peace and tranquility of island life. 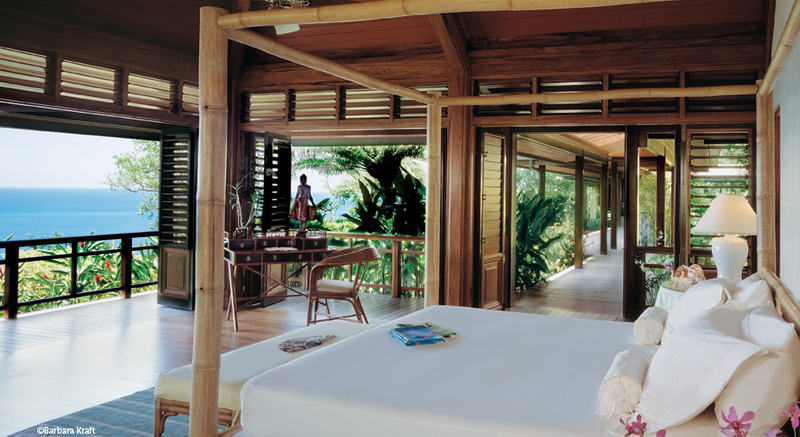 The Wakaya Club & Spa offers ten free-standing Fijian Bures, including seven private Ocean View Bures, one private Garden View Bure, Governor’s Bure and Ambassador’s Bure. Each bure is a luxurious hideaway located just steps from the Pacific ocean, and is designed to indulge you in the beauty of the island while providing every conceivable comfort. The tarif includes “meet and greet” service at Nadi International Airport, guaranteed early morning check-in and late afternoon check-out (which amounts to 2 extra days without charge), all meals and beverages (alcoholic and non-alcoholic), unlimited use of the fully stocked mini bar, unlimited wireless Internet access, and personal laundry service. When you plan a Wakaya wedding, you can choose to be alone with the ceremony and celebration reserved for two. Or you can book the entire island and open up the celebration to your closest friends and family members. When you book the island, Wakaya club staff is at your disposal to create a once-in-a-lifetime vacation experience with your celebration as the focal point. For the ceremony choose the small white 19th century style Wakaya Village church, with its exquisite wall hangings and stained glass windows. Or a ceremony at the water’s edge framed by the horizon of the South Pacific. Nightly rates also include two scuba tank dives per person per day (Monday through Saturday only), and unlimited use of all other sporting facilities and equipment including private beach picnics (Monday through Saturday only), golf, tennis, snorkeling, sea kayaking, Fitness Bure, and croquet. Children under the age of 16 years of age are not permitted at the resort, unless the entire resort is booked by a private party, or when staying in Vale O with their parents (there are limitations).